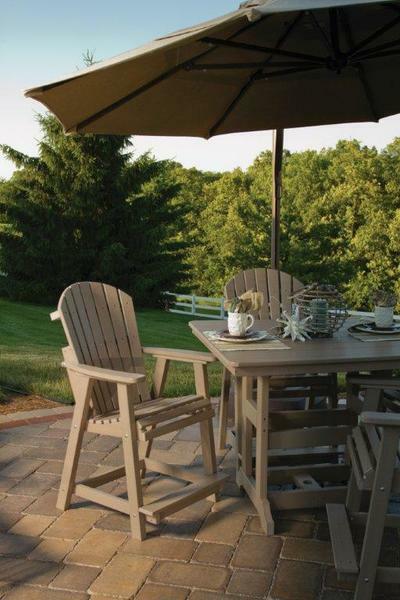 Placed around your Garden Classic Counter Table or placed together on the patio for a quiet seating area, our Amish Poly Comfo-Back Counter Chairs are the perfect addition to any outdoor decor! Handcrafted from an array of colorful poly lumber and made by the hands of skilled Amish craftsman, these chairs are made to last decades facing the elements. Don't forget to add beautiful Sunbrella cushions and throw pillows to your counter chairs for a unique look to accent your outdoor retreat! Height to Seat: 22 1/2"
Height to Arms: 31 1/2"
Yes, we received everything and all is well. We LOVE our furniture! Worth every penny spent on it. Thank you for assisting us and resolving our issue.